The term “builders’ grade” is often slapped on a piece of hardware you’re almost sure wouldn’t pass muster any other way new, much less after 6 or 7 years. Apparently such a term was appropriate for the riser in my toilet, which split for no reason this weekend and flooded the bathroom. I returned from the home center with a Korky brand valve. It wasn’t really more expensive than the cheap crap I was going to put back in it. It was mere nine dollars instead of the seven-dollar kit I was used to, but the difference was astounding. The first thing you might notice is there’s no ball float. The Korky 528 fill valve (pictured) is a twist-and-lock action anti-siphon valve that adjusts by rotating the head a quarter turn, moving it to the correct height, and rotating it back to lock it. The whole thing installs in less than five minutes like any other riser valve, but the feature that’s worth the extra two dollars (and more, really) is that it fills quickly and almost silently. Korky says it will last longer as well, but the quiet flush is really worth it. After hearing how quiet it was and how much easier it is to fit correctly, I’m switching the other can to this system even though there’s nothing wrong with it. For nine bucks, why not? I’ll have to try these. I buy the other ones by the 3-pack and use them as toilet asprin. If a rental unit has any toilet problems, i just stick a new fill valve in while i’m there. If the Korky lasts longer without leaking, spraying or stopping, it will be my new favorite. I wonder if the Korky brand can handle toilet tank cleaners with bleach? Some of the tablets people use can kill a valve in less than 6 months by making the plastic white and brittle. I’ve always figured “builders grade” means just good enough to survive until the day after closing. I want homeowner grade – fix it once and never look at it again. First thing I do when I move into a new place is swap out all those annoying ball floats with these Korky’s. They fill faster and are much quieter. I also swap out the flap, which is usually slimed with biomass and the lever, which is usually corroded and ready to snap. The only thing to be aware of on those dual flush retrofit kits is the height of the tank. Even homes built within the last 20 years started using shorter tanks to save water and the dual flush kits don’t fit. Remember to measure from the top of the flap boss and not from the bottom of the tank. I might get one but I hope it isn’t too quiet. I have been alerted to leaks by the sound of the toilet filling taking too long. I also use korkys, quiet, quik filling. I originally picked the korky for being made in the USA but they work so I continue to use them. It’s def one of those items that you look at and wonder why it’s predecessor even still exists. I highly recommend these. We have 3 bathrooms, and I was always changing out the guts. I asked a plumber friend and he swore by Korky. 3 years later, we haven’t had to change any of our 3 toilets. I thought “builder’s grade” meant “it will all fail at the same time”. Been doing rental property maintenance / handyman work for 30 years. Worked on many 1000s of toilets. Only one already had a fluidmaster in it. It had gravel caught in the valve from city work out at the street. Cleaned it out, easy fix. Fluidmaster is a little more expensive, but IMHO, worth it. Dual flush are available, as are complete kits with every thing a toilet uses. Used to have a 600 unit complex where we would buy cheap replacement toilets & a fluidmaster kit, replaced all guts before installation. I bought the Fluidmaster kits, but they are just as loud as the old school ball and float they replaced. If the Korky’s are that quiet and faster, there must be more to them. I’ve not seen these Korky’s kits at my local big box stores, they just have Fluidmaster kits and lots of the ball/float stuff. The only newer sorta higher-tech looking stuff is in packages for contractors and insanely priced. I put one in a year or so ago. It sometimes does not shut off. You have to take the lid off and tap it. I probably need to figure that out or just replace it. I put in the HydroRight Dual Flush system in and my water bills dropped substantially. Stage 1 is for liquids and stage 2 for solid waste. They are $20 at Home Despot and take 5 mins to install. Ditto on o4tunas post. I work apartment complex maintenance and while they may be quiet, Ive replaced some Korky fill valves with problems at less than a year old, but the fluidmasters have never failed on me. Ill skip the Korkys and only buy Fluidmaster valves. Water hammer will occasionally blow apart the cheap plastic ones. Search a site like Amazon for “brass ballcock.” Be sure to search from a retailer like Amazon or you will not get the results you are looking for. For $20 you can get an heirloom quality all brass unit which takes a $1.00 rubber piece to rebuild when that day finally comes. Brass at 2X the cost of plastic is a complete no brainer to me. If you want it to fill quietly put a flow restictor in the line. I also use the Korky’s, in my home and my rentals. ADDITIONAL BONUS- the valve can be replaced separately instead of having to replace the entire unit. Lift up the white cover and you will see the red/black valve inside. You can buy the valve by itself for 3-4 dollars…and only takes couple minutes to install. Just keep having trouble with Fluidmasters – the plastic gets very brittle after 2-3 years and then leak, won’t fill. 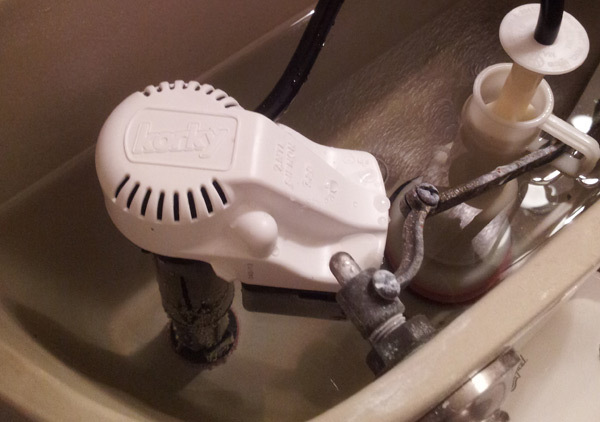 My plumber recommended Korky’s and then I learned that TOTO’s (the best toilet around) uses Korky tank fillers. That’s seems like a very positive endorsement. I would agree, fluidmaster is better, but the question remains: How much money do i really want to spend on a product like this? If you’re handling high-end clients, it’s a no brainer, for sure!